Cover graphic: http://www.wallconvert.com/wallpapers/digital-art/earth-14573.html. Design and layout by Celine A. Quinio. Our JPIC International Coordinator Anne Corry rscj is a member of the Integrity of Creation Working Group of USG-UISG. (Union of Superior Generals - International Union of Superiors General). 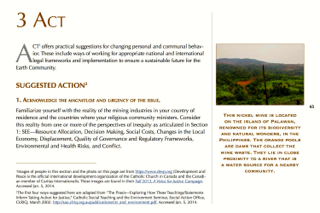 She shares with us this resource on The Impacts of Mining which was developed by this working group for the availability of all religious congregations. The Introduction gives us an idea of the contents of this booklet. To access or download THE IMPACTS OF MINING, click here. The JPIC Commission has its roots in the Pastoral Constitution, Gaudium et Spes (cf. 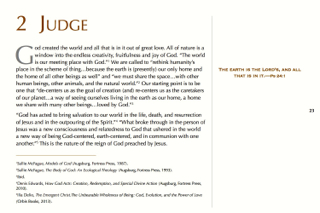 n. 90) and in the Synod of Bishops on Justice in the World (1971). In 1982, it was formally established as a joint working group of the USG-UISG. The Commission serves the USG and the UISG, both as Unions and, each according to its own charism, as individual member generalates, to arrive at a greater awareness, clearer analysis and more effective action in matters of justice, peace and integrity of creation. Its preferential option is for the poor, it values collaboration and sharing, participation and communication, and it is committed to continual learning through observing, reflecting, acting. The purpose of the Integrity of Creation Working Group (ICWG) is to gather information, to increase awareness, to provide informed reflections and to suggest actions concerning the environment. Within the networking of the JPIC Promoters in Rome, the members provide formation resources, encourage religious congregations to be proclaimers of an ecological dimension to our faith, share contributions, and publicize initiatives that religious congregations are continuing to make for the care of creation. 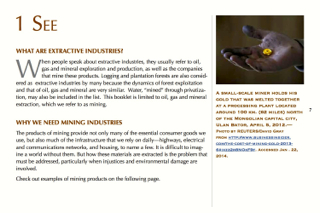 To this end, the Integrity of Creation Working Group has put together this booklet on The Impacts of Mining. We invite and encourage you to disseminate this among the members of your community and colleagues in your ministry. A PDF copy of the booklet is available on the JPIC website http://media.wix.com/ugd/e7a99a_caa491af54624ddf8e6e9555f57f51a6.pdf. Please feel free to download a copy for printing. To print on a copy machine, choose your paper size and select the FIT button, select PRINT ON BOTH SIDES and FLIP ON SHORT EDGE. Click on the LANDSCAPE orientation button. DO NOT use the booklet option. When quoting sections of the booklet, please cite this booklet as your source and provide complete bibliographical/reference data. Thank you to the Integrity of Creation Working Group of the USG-UISG for the permission to make this booklet available on rscjinternational.